« Thermaltake WATER 3.0 Riing RGB 240/360 Review, Is This The Ideal RGB Liquid Cooler? 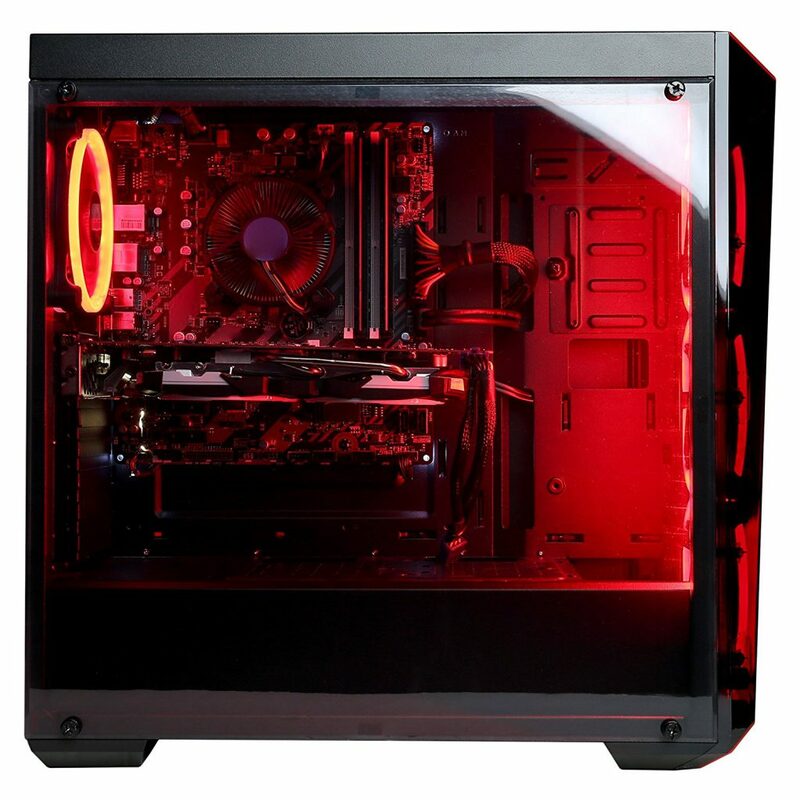 CyberPowerPC (www.cyberpowerpc.com) has been around since 1998 and has proved themselves in the PC gaming industry as one of the best brands around when it comes to pre-built computers with the right amount of power for gaming. For the most part, getting a pre-built PC means that you’re going to be wasting your dollars because you don’t get an optimal amount of power per dollar spent. But with the recent rising prices of PC hardware, pre-built computers have become very relevant. CyberPowerPC is one of the few companies that have always had a fair price in mind even before the rise of cryptocurrency mining which made building a PC harder to do, at least for a fair price. They’re a great company that manufactures and distributes their PCs with the exception of using some big online retailers such as Amazon as an outlet to get the PCs to us. Many have used CyberPowerPC computers for years now and they’ve only gotten better as a company overall, but does the GXIVR8020A4 reflect that? First thing’s first, we need to look at the performance. It doesn’t matter how flashy a PC looks… It’s what’s on the inside that matters most. For around $700+ you should expect to have a rig that’s able to handle anything you throw at it at 1080p resolution with high frame rates. 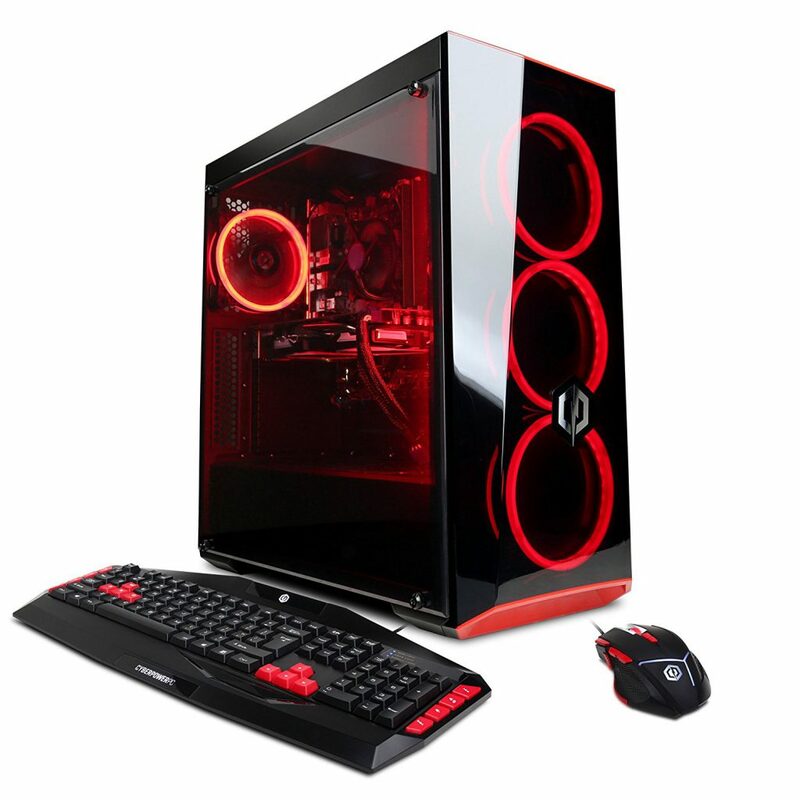 A PC at this price range should perform in-between being a super computer and a computer that is just enough to get the job done. It might not be ideal for serious content creators, but when it comes to gaming performance the i5-7400 is more than enough. Performance in gaming mainly relies on the processing power and the video power. You don’t want too much of one or the other because then you won’t be seeing the maximum potential of the part that isn’t up to par. 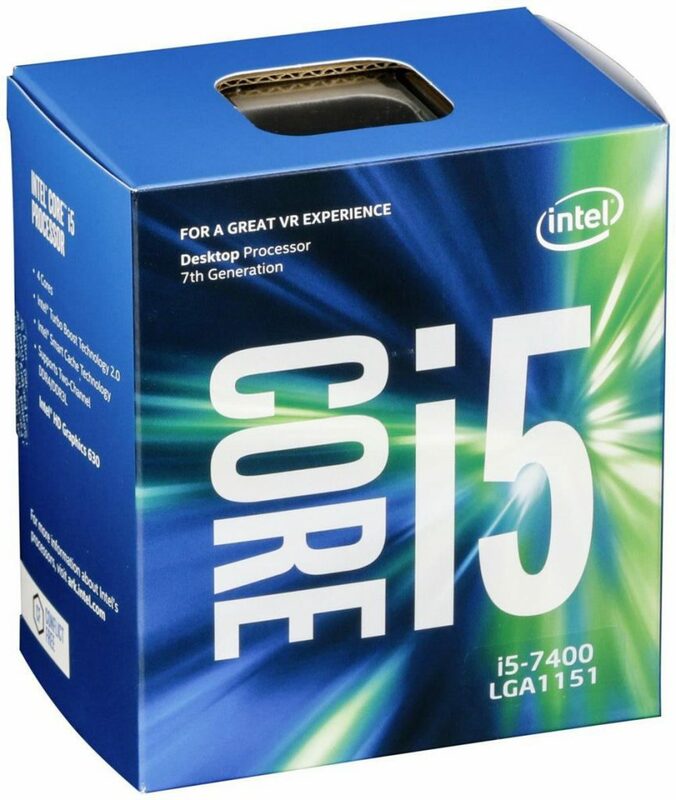 For the CPU this PC has an i5-7400, an Intel processor from the Kaby Lake generation. Pretty much all of the Kaby Lake processors are great for gaming and the i5-7400 is right at the sweet spot. It’s not a super computer processor but it’s perfect if you’re wanting to use the PC strictly for gaming. Having an i7 would be a bit overkill since most games don’t use hyper-threading technology today and they probably won’t for a long while. A higher level processor such as an i7 would be necessary if you planned on doing heavy rendering work such as a lot of video editing or rendering in a bunch of graphics. If you need a PC for processor-heavy tasks as well as gaming then you need to be looking at spending a bit more. With an i5-7400 you should expect to be able to handle any optimized title today with a tweaked high setting to maintain a smooth frame rate. It’s definitely a lot more processing power than any console today and it makes sense to have something like this at this price range for a pre-built PC. A 4GB RX 580 is the perfect type of card for solid 1080p gaming performance. For the video card this PC has a MSI 4GB RX 580. It’s near impossible to find this video card on the market and it’s surprising to see a pre-built PC like this being sold at this price with this card. The RX series cards from AMD were designed with high level performance at 1080p in mind which is exactly what you get with it. 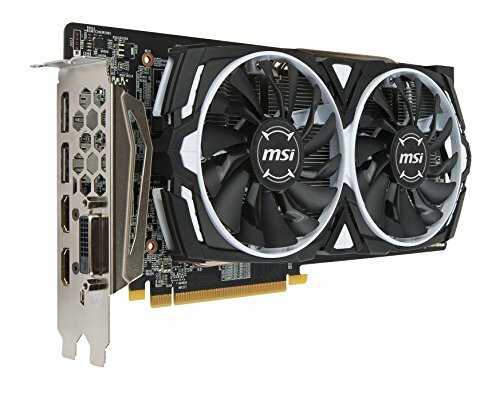 MSI is a reputable brand for creating good quality video cards that last a long time, it’d be nice if they were available at a decent price on the market as a standalone part! Performance can be compared to the performance of nVidia’s 6GB GTX 1060. Sure, the GTX 1060 has 2GB more VRAM but when it comes to overall performance they’re very close. VR gaming is doable with this card as well, though I wouldn’t expect to be able to run the entire future of VR games. For entry-level arcade type games you’ll be able to run them smoothly but when it comes to the higher demanding VR titles… I wouldn’t get your hopes up. You really want to be able to run VR games at 90+ FPS in order to have a good experience which with these specs, you’ll achieve that with most titles. It’s the unoptimized and/or higher demanding titles that won’t run as well. All in all, if you’re looking to game at 1080p resolution with 60 FPS for the most part then these are the types of specs you need for that type of performance. Entry-level VR gaming is totally doable and for the price, this hardware makes sense. The other specs are also important to take note of so let’s take a look at them as well! All of the other hardware is important as well. Sure you can have a solid processor and video card combination but without enough hard drive space for games or the right amount of RAM… that doesn’t matter. We’ve got a 1TB 7200RPM hard drive, 8GB of DDR4 RAM, Wi-Fi installed, three total case fans, Windows 10 pre-installed and a nice mouse/keyboard combo as well for the rest of the specs to go over. With 1TB of hard drive space you’ll be able to get a lot of games installed. Most AAA titles today take up more than 20GB of space so having at least 1TB of space is almost essential. It would have been nice to see a solid state drive included but for the price I can see why it wasn’t included. SSDs are much faster than HDDs so if it had one with Windows installed and a bit of leg room for a few games it would have been a big plus. 8GB of DDR4 RAM is the standard today. If your PC doesn’t have 8GB of RAM then you aren’t going to be able to run today’s titles. This has 2x4GB ADATA RAM sticks installed at 2400MHz speed. Although a direct ethernet connection is the way to go if you’re playing online games, Wi-Fi is ready to go when needed. An 802.11 AC Wi-Fi adapter is used here, there is not any bluetooth included. That would have also been a nice feature but it’s still a little surprising to even have wi-fi included. There are two intake fans in the front and one out take fan in the back. There is plenty of cooling here so there shouldn’t be any worries of the PC getting too hot. Having three case fans included is extremely nice, you don’t see that a whole lot with pre-built PCs nowadays so it’s pretty generous of CyberPowerPC to include them. Windows 10 is installed right out of the gate and there aren’t any programs that you don’t need pre-installed. Some pre-built PCs come with a bunch of unnecessary bloatware so it’s nice to see that CyberPowerPC didn’t include anything that is just there to take up space. The mouse/keyboard combo is actually pretty solid, the mouse is great for 1080p gaming and the keyboard doesn’t feel super cheap. CyberPowerPC has always been good about including a decent mouse and keyboard with their PCs. There are plenty of multi-media keys on the keyboard and the mouse has two extra buttons for the thumb as well as a DPI button at the top. There are two USB 3.0 slots, a headphone jack and a mic jack in the front. Then there are more USB slots in the back, enough for a mouse/keyboard and a USB adapter of sorts. That sums it up for all of the specs. All in all, not a bad deal considering the hardware and what you’re paying for it. There could have been a bit more included but what’s already there is great anyway! If you’re looking for a pre-built gaming rig to handle most games today at 1080p at ultra presets then you need to consider this model. It’d be nice if PC hardware made more sense but with today’s prices on video cards and RAM, this is an ideal way to go if you’re looking to spend ~$700. You get what you pay for and then some. Be sure to also check out some of the reviews that are on Amazon, plenty of people have been using this computer and dig how well it performs. Do you think that the value is there for what you pay? Are you planning on getting this pre-built instead of building your own rig? Tagged cyberpowerpc, gamer xtreme, pre built gaming pc, vr gaming pc. Bookmark the permalink. are there any major benefits it gives over this pc? It’s $300 more and reflects that extra bump in cost with the parts. However, spending over $1,000, you’d be better off doing a $1,000 PC build of your own as you’d get better overall performance for gaming. What do you think? Anything you would change? I ended up not building a pc since it costs around 200 extra for the OS, monitor, wifi adaptors, etc. Please change my mind that it really is worth building it instead. Personally, I’d go with the monitor that is cheaper since they’re both are very similar sizes and they have basically the same exact features. Is one a IPS panel and the other a TN panel? That’d be another factor for me as well since IPS is a lot nicer. Definitely go with what is going to fit your budget then! So just to be sure, you’re looking at this exact desktop instead of the above one, right? It’s a solid pre-built choice for the price. The ENHANCE Scoria headset is pretty awesome if you’re looking for a good wired one that isn’t super expensive. I wrote a full review right here – be sure to check that out. It’s the headset I’m currently using. As for the monitor, it’s definitely ideal since you’re using a 580. FreeSync is nice when you’ve got an AMD card to take advantage of it. Building today makes more sense if you’re really wanting specific parts or a specific case design. Otherwise, with the overall price increases, it makes sense to go with a pre-built desktop instead. Thanks! I just really wanted to confirm this purchase, seeing that I don’t have much computer experience. This was a lot of help! No problem man, it’s what I’m here for. Feel free to check back any time and take a look around at other reviews and what not!